2009 has already brought about many changes and improvements for Central Waters Brewing Company. The biggest step has been the addition of roughly 1,000 square feet of solar collectors; 24 panels, in all. Solar collectors use energy emitted by the sun, and convert it into a more usable and/or storable form of power. The energy production of our new solar collectors is estimated to reach around 2500 therms per year. A payback from the system will be seen in about seven years, with an estimated savings of $1.4 to $1.5 million over the life of the system. In addition to the new solar panels, Central Waters Brewing Company uses a radiant floor heating system, and more energy efficient lighting systems, motors in the equipment, and brewhouse. All of the materials used in the newly remodeled tap room are from recycled resources. Also, with the implementation of the new grain silo outside of the brewery, we are able to reduce the amount of packaging materials that come into the facility, therefore the amount of packaging that needs to be disposed of. In addition to the sustainability practices currently in use at the brewery, Central Waters works with local farmers to recycle the grain used in the brewing process. The spent grain is taken by these farmers and used as feed for livestock, and also used as compost. The addition of the solar collectors, coupled with other sustainability practices, allows Central Waters Brewing Company to drastically reduce the consumption of natural gas, therefore greatly reduce our carbon footprint. Central Waters Brewing Company…truly "making the world a better place, one beer at a time." Antonia Juhasz is an author and political activist. She was the author of The Bush Agenda: Invading the World One Economy at a Time in 2006, Alternatives to Economic Globalization for which she received the 2004 Project Censored award. In 2008, she published The Tyranny of Oil. Alan Weisman spoke at the 10th Anniversary Energy Fair, and we’re happy to have him join us another ten years later to celebrate our progress and help us look forward to another 20 years. Alan Weisman is an author and journalist whose reports from around the world have appeared in Harper's, The New York Times Magazine, The Atlantic Monthly, The Los Angeles Times Magazine, Orion, Wilson Quarterly, Vanity Fair, Mother Jones, Discover, and more. His most recent book, The World Without Us, (a staff favorite) is a bestseller, and was named the Best Nonfiction Book of 2007 by both Time Magazine and Entertainment Weekly. Wendy Williams, an is the author of Cape Wind: Money, Celebrity, Class, Politics, and the Battle for Our Energy Future on Nantucket Sound. The Wall Street Journal called Cape Wind "a ripe subject, populated with the sort of people who would be among the first to count themselves as friends of the Earth but the last to accept an environmentally friendly energy source if it meant the slightest cloud on their ocean views." Williams has written for many major publications, including Scientific American, The Christian Science Monitor, The Boston Globe, The Providence Journal and The Baltimore Sun. She has been journalist-in-residence at Duke University and at the Hasting Center. The author of several books, she lives on Cape Cod. While many students head home, start their summer jobs, or begin long vacations, some students in the WISPIRG Student Chapters are hitting the road in support of high speed rail. Forty students will travel next week from Green Bay to Milwaukee to Madison to La Crosse over four days to show support for Wisconsin’s proposed high speed rail route. President Obama seeks to connect our cities in “priority corridors” (including the Chicago-Milwaukee-Madison-Twin Cities route) with high speed rail. Congress this year passed the American Recovery and Reinvestment Act, which will spend $8 billion for high speed rail on projects that have not yet been determined. Governor Doyle and WISDOT Secretary Busalacchi are advocating to bring high speed rail to Wisconsin; they are seeking Recovery funds to connect Madison and Milwaukee with intercity rail as part of the Midwest Regional Rail Initiative, a nine-state project that would connect over 100 Midwestern cities and link the region’s major economic centers. Doing so will give us more transportation choices, alternatives to lengthy airport delays, and reduced dependence on oil, while helping to rebuild our economy. Wisconsin would especially benefit because it is perfectly situated in the corridor connecting Chicago to the Twin Cities. Enthusiasm for the project among students and other young people is infectious. At most stops students are planning a short bike route through each town to the location of the media event. WISPIRG students will wear matching t-shirts and carry a giant map of the proposed train route. Events will also include a human-powered train with many people, much like a Chinese dragon costume. Come join us to show support for bringing high speed rail to Wisconsin! 3pm Oconomowoc - Maxims, 115 E. Collins St.
A California couple has pledged $5 million to endow a chair at Marquette University's engineering school. The Thomas H. and Suzanne M. Werner Chair in Secure and Renewable Energy Systems will lead a multidisciplinary research cluster of four to six faculty members and develop an advanced curriculum, said Stan Jaskolski, Marquette's dean of engineering. Marquette is working with the Milwaukee School of Engineering and University of Wisconsin-Milwaukee to create a major research cluster for sustainable energy, Jaskolski said. "Gifts like this are just tremendous momentum builders," he said. Thomas Werner said his vision for the program is that it "trains new technologists in a new field and primes the pump for America to be the innovator in renewable energy." "Our hope is that we see tangible accomplishments in a field that's important to the planet," Werner said. The gift will position Marquette as a leader in southeastern Wisconsin in this academic area, where students will work with faculty to pursue fields such as solar electric energy generation, modern electric drives and the design of products that make energy consumption more efficient, said Jaskolski, who was previously Eaton Corp.'s chief technology officer. It also will help strengthen Wisconsin's growing "clean tech" sector, which includes water, wind, solar, geothermal and biofuel technologies spread across many areas of the state, said Tom Still, president of the Wisconsin Technology Council. A coalition of community and environmental groups is urging Governor Doyle and the Department of Transportation to devote economic stimulus money to expand and improve Wisconsin’s public transportation system. In a letter to WisDOT Secretary, Busalacchi the coalition urged that money allocated to Wisconsin by the American Recovery and Reinvestment Act of 2009’s Surface Transportation Program (ARRA STP) go to projects that will deliver the highest return on investment. The coalition particularly urged that funds be spent to improve transit in low income communities. The letter states that “Sustained economic development depends on engaging as many people as possible in the economy. For the broader economy it is better for someone who is unemployed to get a job than for someone who is already employed to switch jobs. Putting or keeping transit in communities with high unemployment produces up to 2.5 times more jobs than putting transit in communities with low unemployment." MADISON – The public is invited to comment on an Environmental Assessment (EA) prepared by the Department of Natural Resources for the Enbridge Alberta Clipper petroleum pipeline system project. Enbridge Energy Company, Inc., 119 N. 25th Street East, Superior, WI 54880-5247, has applied to DNR for waterway and wetland crossing permits, and air quality permits for the proposed project. The company will also need a stormwater permit and an endangered resources review for the project. The proposed pipeline project consists of constructing a new 36-inch diameter petroleum pipeline (known as the Alberta Clipper pipeline), a new 20-inch diameter diluent return pipeline (known as the Southern Lights pipeline), an associated pump station for the Southern Lights pipeline, and five 250,000 barrel breakout tanks. The proposed pipelines would be constructed along a 13 mile route in Douglas County from the Wisconsin-Minnesota border to the Enbridge Superior Terminal in Superior, Wisconsin. The pipelines would be largely constructed in parallel within an existing pipeline right-of-way that includes four other crude oil pipelines. The pump station and the breakout tanks would be constructed at the Enbridge Superior Terminal at Superior. The purpose of the Alberta Clipper petroleum pipeline and breakout tanks is to bring crude oil from the tar sands area of Alberta, Canada to refineries in the Midwestern U.S. The Southern Lights diluent pipeline and pumping station are intended to return diluent from the Midwestern U.S. refineries to Alberta, Canada. Diluent is similar to gasoline, and is used to thin crude oil so that it can be pumped through pipelines. The proposed pipelines would require 17 water body crossings, including 10 tributaries to the Pokegama River, three un-named waterways, two tributaries to the Little Pokegama River, one crossing of the Pokegama River, and one crossing of an un-named tributary to the Nemadji River. The proposed pipelines would temporarily impact approximately 75 acres of wetland. The pump station and breakout tanks at the Superior Terminal would fill approximately 12 acres of wetland, and temporarily impact approximately 3 acres of wetland. Air emissions directly associated with the proposed pipeline project at the Enbridge terminal in Superior are from the proposed construction and operation of five new external floating roof tanks having capacities of 8.7 million gallons each, and from associated fugitive emissions from pumping and piping on site. The estimated potential emissions from the tanks and associated fugitive sources are 39 tons per year of Volatile Organic Compounds (VOCs). The project will also increase the facility emissions of hazardous air pollutants from crude oil (e.g. benzene, n-hexane). Construction and operation permits from DNR’s air management program will be public noticed separately. . . . Copies of the environmental assessment that led to the DNR's preliminary determination can be obtained from Benjamin Callan, Water Management Specialist, at DNR (OE/7), PO Box 7921, Madison, WI 53707-7921, or via E-mail at benjamin.callan@wisconsin.gov. DNR has scheduled a public informational hearing where individuals can learn more about the proposed project and submit written or oral comments about the EA and any DNR wetland and waterway determinations associated with the project. The public informational hearing will be held on June 4, 2009 at the City of Superior Public Library, Large Meeting Room, 5:30 to 8 p.m.
Public comments on the environmental assessment are welcome and must be submitted to Benjamin Callan no later than 4:30 p.m., June 8, 2009. The Orange County Convention Center’s $8.8 million solar project that will turn sunlight into electricity is ready to go on line. The photovoltaic array, the largest in the Southeast, uses solar panels on the center’s roof to generate 1.1 megawatts of power, enough to provide electricity for 80 to 100 residential houses. The array is expected to considerably reduce the center’s energy demand. The panels cover about 200,000 square feet of the north/south building’s rooftop. Visitors to the center will be able monitor the system’s output at an on-site education center. The education center also promotes the environmental and economic benefits of solar and other renewable-energy technologies. Students in P.J. Jacobs Junior High School construction class are doing their part for the environment. On Tuesday, 18 ninth-graders spent the day building a 10-foot-by-20-foot garden house behind the vacant Jackson Elementary School. The garden house is meant to supplement a new organic vegetable garden established by the Sustainable Communities Committee, a group of citizens promoting efficient practices. Stevens Point residents can set up a 12-foot-by-4-foot garden box for free, and once the students are finished, the building will be used for storage and garden prep work. "We think it's going to help the neighborhood. We're in the heavily forested area, so we don't have sunlight in our backyards for our gardens at home," said committee member Wes Halverson, 68, adding the land near the school is exposed to sunlight. "We want to get a lot of things planted this spring." Construction teacher Dave Rasmussen said he hopes to have the structure done before May 27, but the $5,000 floor plan is short on funds. Halverson, a retired University of Wisconsin-Stevens Point environmental management professor, donated $2,000, but the students are looking for the extra cash. "The economy is killing us. We need somebody else in the community (to help us)," Rasmussen said. Andrea Stafford, one of Rasmussen's former students who is now an architect in the Chicago area, has teamed up with the class to design the facility, and Kulp's of Stratford LLC in Wausau is donating a steel roof. The students' work will help with rooftop rain collection and storage for tools. "There's no electricity and therefore, there's no water. So, we have to be sustainable," Halverson said. "We have to put in rainwater collection and the hand pump to pump up water from high ground water. We'd like to put in a solar water pump eventually once we pay for the building." Uncertainty about the availability and cost of biomass fuels makes Gov. Jim Doyle's $251 million plan to overhaul a University of Wisconsin-Madison power plant somewhat risky, according to a report released Tuesday. Doyle has proposed converting the coal-fired Charter Street plant, long a major polluter in the area, to run on cleaner-burning biomass fuels such as wood chips and paper pellets. His administration says it would be one of the nation's largest biomass projects and the plan has delighted environmentalists. A report from consultants hired by the state recommended Tuesday running the plant on a mix of natural gas and biomass and installing a more expensive boiler that can burn any type of biofuel. But the report also warned the state's biomass market must be expanded for the project to be successful. The report said the state should get its money back over 25 years from building the more expensive boiler as long as enough biomass fuel supplies are developed and they cost less than natural gas over time. . . . The report said there was "a significant risk" that not enough biomass supply would be available for the boiler when it is expected to begin running. Wood products would likely be the main source of fuel for the plant in the beginning while others are developed, the report said. Paper pellets are another cost-effective biomass source, but they are currently in short supply. Switchgrass and agricultural waste currently cost more than natural gas. Computers waste a lot of electricity if they remain turned on when not in use. As the Chippewa Falls Area School District recently discovered, the cost savings from reducing computer-related energy use can make a real difference. The district began turning computers and monitors off during evenings and weekends and saw an immediate budgetary impact. The cost reduction from this one energy saving measure saved a staff position that would have been eliminated due to budget cuts. “We always tell our schools they can cut energy costs in a lot of different ways,” said Charlie Schneider, program manager for the Focus on Energy Schools Program. “Many steps are small, but they can really add up.” Focus on Energy’s Schools Program maintains an on-line maintenance listserv for over 100 school building and grounds managers around Wisconsin. When participants have a good idea or a question about any maintenance issue, including energy efficiency, they share it with colleagues by posting it to the listserv. Recently, a Focus on Energy staff member alerted participants about a free software program created by the U.S. Department of Energy (DOE). This program automatically puts networked computer monitors “to sleep” when they are not being used. Bob Severson, the director of buildings and grounds at Chippewa Falls Area School District saw this message and was intrigued by the energy savings potential. His district currently owns and operates 1,150 computers. And he knew that his schools, like many around Wisconsin, do not have a formal system for putting computers into “sleep” mode or turning them on and off during evenings and weekends. . . . The energy savings are real: this one energy saving step will save the district approximately $30,000 each year. And, at a recent school board meeting where difficult budget issues were being decided, it became clear that this unexpected reduction in energy costs will help offset a proposed staff cut. For more information about computer use in schools, call Focus on Energy at 800.762.7077.
. . . at the VEDA meeting, which was held Wednesday, two area initiatives received recognition through the VEDA Star Awards. Coulee CarShare Cooperative is based in Viroqua and will serve the Coulee region by providing a variety of vehicles for short-term rental by members. A reservation schedule will be available online soon. In accepting the award on behalf of the project, Kimberly Errigo said, “This car-share program can reduce the cost of driving, and reduce the impact of vehicles on the local environment.” Jerry McIntire said, “Members can avoid owning a second car and, in some cases, may be able to manage without a car at all.” For more information on this project you may send an email to: couleecarshare@gmail.com. The second venture cited was the Food and Farm Initiative coordinated by Valley Stewardship Network (VSN). The goal of this project is to link local farmers and food producers directly with customers. The Initiative hosted the Local Harvest Dinner last October and has been conducting a year long inventory of local food producers. According to Jessica Luhning, VSN Projects Coordinator, a study has been underway for eight months regarding the impact of local food systems on the economy. Ken Meter, a nationally known rural economist and president of the Crossroads Resource Center, served as a consultant on the project and will present some of the findings at a May 21 event from 6:30-8 p.m. at Vernon Memorial Healthcare’s Community Rooms. A Wisconsin Rapids-based manufacturer is leading the charge to create standardized training for the growing wind energy industry. Energy Composites Corp., the parent company of Wisconsin Rapids-based Advanced Fiberglass Technologies, is working with the U.S. Department of Energy and a Norway-based company to develop a universal standard of training that would include an internationally accredited curriculum. "The idea is in the industry we don't have a way of assuring we have trained individuals ... (who) have some way of proving their capabilities," said Sam Fairchild, Energy Composites' chief executive officer. Det Norske Veritas, a global certification company, began developing wind energy standards when the industry first started in the early 1980s, but those standards were limited to equipment and building techniques -- not training, according to the company's Web site. Energy Composites signed a letter of intent with Mid-State Technical College last week to establish a 12-credit certification program that will be the first of its kind and set the precedence for other wind energy companies. "We're pretty confident that we can get that done by spring semester next year with the first course load," Fairchild said. "The guys at Mid-State have been great. The retraining of people is something that is precisely up their alley." A view of the Blue Sky Green Fields wind farm from the project's operations center. Tours will be given approximately every 30 minutes. Please stop by at your convenience during the tour hours listed above. No reservations required. The turbine is located a short walking distance from the parking area. Please wear sturdy shoes suitable for walking on a graveled surface. The Blue Sky Green Field Wind Energy Center, located in the towns of Calumet and Marshfield in northeast Fond du Lac County, is designed to generate 145 megawatts (MW) of electricity, and is capable of powering approximately 36,000 average residential homes. The site consists of 88 wind turbines. Construction of the project began in June 2007. On May 19, 2008, Blue Sky Green Field was placed into commercial operation. We invite you to visit our facility and learn more about wind energy. If you have any questions, call 920-980-3224. Richard and Margie Irland are demonstrating the capabilities and benefits of renewable energy technologies on the rooftop of their New Glarus, Wis. home.The Irlands worked with the local utility just more than a year ago to install a 3.1 kilowatt solar photovoltaic (PV) system that provides the couple’s home with clean, sustainable energy from the sun. New Glarus Light &Water and WPPI Energy supplied a $9,697 grant toward the purchase and installation of the $25,000 renewable system. Solar PV systems collect energy from sunlight and convert it into electricity, providing renewable, emissions-free energy.The Irland’s highly visible project demonstrates the environmentally friendly technology, while educating the community about the benefits, operation and performance of such systems. The couple continues to look for ways to reduce their carbon footprint and have recently installed a solar domestic hot water system and increased insulation levels in their 15-year-old home. JANESVILLE — Jeffrey Helgesen’s life is all about challenges. His two sons from a first marriage are Navy SEALs. One just returned from his third tour in Iraq and Afghanistan, but the other remains in Iraq. His father, with whom he’s had a rocky relationship, suffers from dementia. And the developer’s largest Janesville tenant has flown the coop, leaving Helgesen with a massive hole in his commercial real estate portfolio. One challenge after the next, he worries about them all. But before you start feeling bad for Helgesen, don’t, he says. He’s happily remarried and spends a lot of time at his summer home in Menomonee, Mich., a perfect port to launch his 52-foot “Gaudior” on extended sailing trips across the Great Lakes. His relationship with his father, legendary Janesville businessman Don Helgesen, is better than it’s been in decades. And that empty 700,000-square-foot building on Janesville’s south side? It’s been cleaned, repainted, outfitted with energy-efficient lighting and heating fixtures and stands ready for tenants that Helgesen hopes will build alternative energy components and provide good jobs to the local economy. LSI, a just-in-time supplier to the Janesville General Motors plant, ended its lease of the 10-year-old building on Venture Drive in December. With LSI supplying a struggling auto industry, Helgesen knew he was on shaky ground with just one tenant in the huge building. Not enough eggs in one really large basket, he says. The LSI building accounts for nearly 58 percent of the 1.2 million square feet Helgesen leases in Janesville. . . .
Helgesen, a frequent player in the city’s tax increment finance districts, would like to lease the space to alternative energy manufacturers. He’d also accommodate distribution or warehousing operations. “The reality is that we’ve lost so many manufacturing jobs because of the North American Free Trade Agreement,” he says. “High fuel costs brought some of them back, but unfortunately our wage rates and health care have priced us out of the market. Janesville’s future, Helgesen believes, rests largely on companies that will manufacture components for renewable energy markets. He’s watched cities like Newton, Iowa, and Wisconsin Rapids land companies and jobs in the alternative energy industries. “I’m always pushing our people and the economic development people on this,” he says. “Why can’t we get those contracts? Those communities got over the idea that they were somehow going to maintain a dynasty industry forever. A housing development proposed for Milwaukee's Bay View neighborhood would produce the same amount of energy as it consumes, if the project goes forward. The city Housing Authority is proposing the $40 million development, dubbed Eco-Bay, for the former Army Reserve site at 2372 S. Logan Ave.
Eco-Bay would feature 20 single-family homes and townhomes, which would be sold at market rates. It also would have 110 to 120 below-market rental units: 75 to 80 independent living senior apartments, and 35 to 40 assisted living senior apartments, the Department of City Development announced Thursday. The Housing Authority would finance Eco-Bay with private investments, funds from the U.S. Department of Housing and Urban Development, and federal tax credits given to developers of affordable housing, said Bobbi Marsells, the authority's assistant secretary. Local developers that receive the credits agree to provide apartments at below-market rates to people earning no more than 60% of the Milwaukee area's median income - $32,520 for a two-person household. The authority is in the preliminary stages of obtaining financing, and it hopes to begin building the development in spring 2010. It would be a showcase for sustainable construction. The housing would include solar energy panels, geothermal heat pumps, and a plan to contain all storm water on the 5.6-acre site, according to the Department of City Development. Have you ever wondered how energy-efficient your business is? Alliant Energy's Business Efficiency Check Up can help! This free interactive, online tool will help you find where your energy is going and how you can cut energy costs throughout your facility. - Efficiency Fast Track: Identify energy-saving opportunities and get started on them - fast! - Detailed Analysis: Make an in-depth energy assessment to get detailed recommendations and project assistance specifically for your business. - My Benchmark: Compare your energy use to see how you stack up against the competition. - Case Studies: View quick tips and examples of how similar businesses save energy. After you've completed your check up, you can return at any time to review, track and evaluate the projects you've selected for your facility. Energy independence and an educated workforce are critical to a prosperous future for Wisconsin. To respond, the University of Wisconsin-Extension is charging in with a bold new degree: the nation's first online sustainable management bachelor's degree. For the first time, University of Wisconsin-Extension has brought together the strengths of four campuses UW-Parkside, UW-River Falls, UW-Stout and UW-Superior‹to craft a degree program that equips workers with the management skills they will need to lead sustainable business initiatives. . . . The sustainable management degree takes the theories of sustainability and makes them tangible in the business setting, through a hands-on, problem-solving approach. By learning the fundamentals of the "Triple Bottom Line," graduates can immediately start helping their companies create profits, preserve the environment, and improve their surrounding communities. Get a solid foundation in the fundamental design, operation, maintenance and installation techniques to work with renewable technologies. Workshops and a visit to the energy fair will keep you engaged and on the cutting-edge of technology. Take advantage of this FREE hands-on opportunity to learn about renewable energy! • Growing Biofuels - Biorefinery. Find out how crops and waste products turn into ethanol and biodiesel. Learn how these fuels are used and what the limitations are. Discover how to make your very own batch of biodisel from oil! • Personal Energy - Energy Efficiency. Explore your energy use patterns at school or home. Discover ways to reduce your personal energy use. • Solar Car - Renewable Electricity. Students will examine solar cells by building a solar powered model car. Test out the performance of the model car under various conditions. • Cookies - Renewable Thermal. Learn to construct a solar water heating system and enhance your experience by baking cookies from the sun! The Energy Fair features hundreds of workshops and exhibits all emphasizing clean energy & sustainable living. Registration deadline is Friday, June 12. All hand-on workshops, the energy fair, transportation, lunch & snacks are at no cost to high school students. Student’s will receive one MSTC college credit for participating all three days. 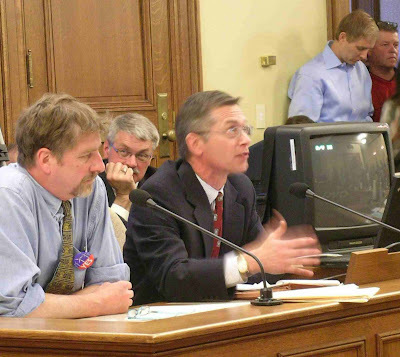 The Energy Fair is the oldest and largest event of its kind in the U.S.
State Senator Jeff Plale (right) of Milwaukee testifies in support of identical companion bills (Senate Bill 185 and Assembly Bill 256) that he co-authored with State Rep. James Soletski (left). The bills direct the Public Service Commission to begin a process to set state-wide uniform standards for wind project permitting. In addition to missing out on an estimated $3.5 million of economic opportunity for each wind turbine not built in Wisconsin, the state also is missing out on new energy without uniform standards. “We’re looking at about 600 megawatts of stalled energy right now,” said R.J. Pirlot, director of legislative relations for Wisconsin Manufacturers & Commerce. State Sen. Jeff Plale, D-South Milwaukee, author of the statewide wind farm siting bill and chairman of the Senate Committee on Commerce, Utilities, Energy and Rail said the inactivity is disappointing. RENEW Wisconsin's executive director Michael Vickerman also testified. The GreenMax Home, the region’s first owner-designed and occupied net zero energy home (NZEH), has quickly generated interest for community members and renewable energy enthusiasts. Homeowners Tom and Verona Chambers are opening the doors to their NZEH and hosting public tours with WPPI Energy to showcase the energy-efficient construction and sustainable energy systems that make their Black River Falls home unique. With grant funding from WPPI Energy’s GreenMax Home initiative, the Chambers’ designed and constructed an all-electric NZEH, which they completed in spring 2009. Through careful planning and research, the Chambers worked to refine their home’s design to control energy use, ultimately advancing the status of their home from highly efficient to net zero. Saturday, May 16 from 1 to 5 p.m.
To schedule a tour, visit www.greenmaxhome.com/projects. Open to the public, the tours will take place at the site of the Chambers’ NZEH. From the ground source heat pump to structural plumbing and the solar photovoltaic system, interested parties will learn about home energy use and renewable energy systems while getting a first-hand look at the state-of-the-art, energy-efficient construction techniques and features that make this NZEH so unique. 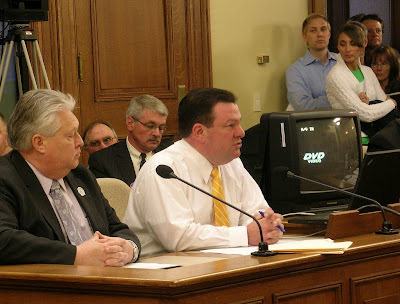 Michael Vickerman (left), RENEW Wisconsin's executive director, listens to Curt Pawlisch, repesenting Wind for Wisconsin, during their testimony on May 12 in support of identical companion bills (Senate Bill 185 and Assembly Bill 256) to begin a process to create state-wide standards for wind siting in Wisconsin. Brian Rude of Dairyland Power looks on from the background. By 2010, more than one-half of the wind energy serving Wisconsin utilities will come from neighboring states. + Crane Creek, a 99 MW project located in Iowa that Green Bay-based WPS will own, was permitted in 2008 and will be operating by 12/31/09. + Twin Creeks, a 98 MW project located in Manitowoc County in WPS territory, received a permit in 2005. Due to a combination of litigation and ordinance changes, ground was never broken. Under the current ordinance, it is highly unlikely that the Twin Creeks project will be built, even though it has a permit. + Local governments lose $392,000/year in future revenues. + Local landowners lose $294,000/year in future rents. + Construction jobs are outsourced to Iowa. If we don’t initiate a process to establish uniform permitting standards, it will be difficult for utilities to comply with an increased Renewable Energy Standard at any level above current law. Crane Creek, a 99 MW project located in Iowa that Green Bay-based WPS will own, was permitted in 2008 and will be operating by 12/31/09. Twin Creeks, a 98 MW project located in Manitowoc County in WPS territory, received a permit in 2005. Due to a combination of litigation and ordinance changes, ground was never broken. Under the current ordinance, it is highly unlikely that the Twin Creeks project will be built, even though it has a permit. Stimulus money is flowing. It could nurture green jobs, energy, and transit. But will bureaucratic inertia and a powerful status quo stifle Wisconsin’s green future? Milwaukee Public Television will broadcast this forum on Friday, May 15, Channel 10.1and 10, 10PM and Sunday, May 17, Channel 36.1 and 36, 3PM. Programs also run on Time Warner's, "Wisconsin on Demand," (WIOD), Channel 1111. Check listing. All programs will be available for checkout from your local public library. Podcasts of the programs will be posted after broadcast at www.4thStreetForum.org. Green Bay, WI – Twenty-seven high school teams are set to take part in the 13th Annual Solar Olympics on Wednesday, May 13, on the campus of UW-Stevens Point. The event is free and open to the public. "The schools' energy and creativity really shine at Solar Olympics," said Chip Bircher, Renewable Energy Product Manager for WPS. "These high school students are really enthused about making a difference with renewable energy. Many of our customers are investigating "green" options to benefit the environment, and Solar Olympics is a great event for everyone to learn more." Editor's note: Legislative committees will hold a hearing on the bill (Senate Bill 185 and an identical companion Assembly Bill 265) on May 12 in the State Capitol. Bipartisan legislation introduced in the state Senate last week seeks to make it easier for developers to build wind turbines in Wisconsin. Authored by State Sen. Jeff Plale, D-South Milwaukee, Rep. Jim Solestki, D-Green Bay, and Rep. Phil Montgomery, R-Ashwaubenon, the bill would keep local municipalities from putting in place restrictive, anti-wind ordinances. Tremplealeau County and the towns of Magnolia and Union in Rock County recently adopted ordinances that make it difficult, if not impossible, to construct wind turbines. In 2007, Trempealeau County adopted an ordinance with a 1-mile setback limit from any occupied dwelling, which some have called the strictest anti wind power regulations in the country. "There literally isn't one square inch in Trempealeau County where you can lawfully place a turbine," said Ryan Schryver, an advocate with Clean Wisconsin. "It's no accident that every municipality uses different setbacks. There are no standards." Senate Bill 185 would establish statewide setback and other standards and would require a Public Service Commion-led stakeholder committee to oversee the process. "I think everyone will get a seat at the table," Schryver said. Among those at the table would be non-compensated landowners, PSC representatives, developers and other state agencies. The bill would not, however, automatically roll back the strict standards already in place in some towns and counties. "It's not going to trump any existing ordinances without taking them into consideration," Schryver said. Ron Winn of Ettrick hopes the bill would roll back existing ordinances. Winn is suing Trempealeau County for the right to build a turbine on his property. Winn, who is suing on his own behalf, is a partner in the development company AgWind Energy Partners, which had erected test towers near Ettrick before a wave of backlash killed the project. Because of the pushback it received in Trempealeau County - and the resulting expense - the company has set its sights on other wind projects, including one near Alma in Buffalo County. Chicago - Anyone looking for signs that sectors of the economy have found some shelter from the recession needed only to walk the halls of the McCormick Place convention center Thursday. With more than 1,200 exhibitors, the world's largest trade show for the wind power industry saw record attendance in its bid to prove that energy from wind has escaped the label "alternative." "When you look at this show, you wouldn't know there's a slowdown in the economy," Kim Zuhlke, an executive at Alliant Energy Corp., said while standing between massive booths at the conference Thursday. Organizers of Windpower 2009, sponsored by the American Wind Energy Association, weren't sure how their conference would do, but the show ended up attracting more than 20,000 people. That's 60% more than attended last year in Houston, the association said. The recession has hit the wind power industry just like every other sector of the economy, as projects stalled for lack of financing. In an industry forecast earlier this year, the association said the wind industry is likely to slow this year after setting records for new projects last year. "Everyone's been in a holding pattern. It's not just wind energy - the entire country had taken a pause," said Ellen Shafer of Broadwind Energy, based near Chicago. But the mood at the convention this week has been one of optimism, said Shafer, whose company has two Wisconsin subsidiaries - TowerTech, a Manitowoc maker of wind towers, and Badger Transport of Clintonville, a trucking company specializing in hauling the oversized components that are the of a wind farm development. But the mood at the convention this week has been one of optimism, said Shafer, whose company has two Wisconsin subsidiaries - TowerTech, a Manitowoc maker of wind towers, and Badger Transport of Clintonville, a trucking company specializing in hauling the oversized components that are the ingredients of a wind farm development. MARSHFIELD -- A ranch-style home under construction in Marshfield's Prairie Run subdivision will be central Wisconsin's first verified "green-built" home. "That means it meets the national standards for green building and it will be certified" during different steps in the construction process, said Jeff Redetzke, owner of JR Builders of Marshfield, which is constructing the house. "A green-built home is a good value for a home buyer," Redetzke said. Using geothermal energy cuts a natural gas bill by 50 percent to 70 percent, he said. There are a multitude of components considered and used in building a home that maximizes energy efficiency while diminishing its carbon impact on the Earth, Redetzke said. "We try to use materials that will last for 50 years and are recyclable afterwards. Like a metal roof is very green. It lasts for the life of the house and later can be recycled," he said. Geothermal energy and other energy efficiency building standards are practices embraced by the developers and owners of Prairie Run, said Dan Helwig, one of the development's owners. "We're just totally excited. This is the kind of home that hasn't been seen in this marketplace," Helwig said. Prairie Run was conceived to utilize green or sustainable concepts in developing the site and in building a variety of homes and businesses, Helwig said. "I've wanted to do something like this, and Prairie Run is the right place," Redetzke said. In the most recent round of federal renewable energy grants, Wisconsin led all states in capturing project dollars to address market and development challenges associated with wind energy. The U.S. Department of Energy (DOE) announced that a Wisconsin non-profit organization and three post-secondary schools captured more than $1 million for projects to promote market acceptance and workforce development, two challenges identified in a 2008 DOE report. The University of Wisconsin-Madison will receive nearly $600,000, while the University of Wisconsin-Milwaukee will receive just over $300,000 and Lakeshore Technical College (Cleveland, WI) a little less than $200,000. “Our success in receiving these awards is a reflection of the State of Wisconsin's strong commitment to expanding the wind energy marketplace here,” said Michael Vickerman, executive director of RENEW Wisconsin, a statewide renewable energy advocacy organization. RENEW Wisconsin proposed in its grant application to develop a one-stop online source of information for wind developers, state and local policymakers and regulators, and the general public. The web site will include documents and links to relevant state and federal statutes and rules, facts sheets on everything from aesthetics to court decisions, zoning, and other resources, as well as a calendar of upcoming workshops, seminars, training, briefings, grant opportunities, RFPs, and other relevant events and opportunities. The other grants will promote workforce development. The UW-Madison will provide short courses in wind power plant design, construction and operations and develop curriculum to integrate wind energy systems curriculum into power engineering education programs; the UW-Milwaukee intends to create a wind energy educational collaborative in southeastern Wisconsin; and Lakeshore Technical College will develop additional partnerships to boosts its ongoing wind technician training programs. Full list of awards and DOE news release at http://www.energy.gov/news2009/print2009/7381.htm. MILWAUKEE (May 5, 2009) — On April 4, 2009, Prairie Apartments, an innovative eco-friendly new construction building, opened its doors to low-income Milwaukee residents experiencing obstacles such as homelessness and mental illness. With the help of Focus on Energy, developers Heartland Housing of Chicago and Guest House of Milwaukee were able to integrate energy efficiency measures into the 24-unit complex. To save energy and money, Focus on Energy worked with the developers to make extensive use of ENERGY STAR® qualified compact fluorescent fixtures and lighting occupancy sensors in most of the common areas. In addition, ENERGY STAR qualified appliances, programmable thermostats and windows were also used throughout. Moreover, the building’s well-sealed envelope reduces air leakage, and works hand in hand with high efficiency cooling and heating equipment. In fact, the facility’s standards of design are so high it was built to achieve the prestigious Leadership in Energy and Environmental Design (LEED) for Homes certification. Overall, the improvements should save the building more than 4,000 therms of natural gas and about 72,500 kilowatt hours of electricity annually; not to mention $13,000 a year on energy costs. An eight-hour public hearing last week at the Capitol highlighted a threat to the statewide interest in developing wind power. The hearing also demonstrated why lawmakers should quell that threat by replacing a hodgepodge of local rules for smaller wind farms with uniform state standards. At stake is not only a clean, renewable source of energy, but also the state's economic vitality. Wisconsin is counting on wind power to propel the state 90 percent of the way toward meeting a goal of more than doubling the renewable energy contribution to electric needs over the next six years. Developing wind power, and other forms of renewable energy, can help resolve global warming worries, improve energy security and generate jobs. But a barrier looms: When developers of smaller wind farms apply to local governments to build turbines on specific sites, they too often find that local officials are cowed into imposing impossible-to-meet requirements, or even moratoriums, after opponents raise alarming concerns, commonly based in misinformation. As a result, a few people gain veto power over the state's energy policy. Granted, not every location is suitable for wind farms. Local concerns about public safety and health should be respected, when based on sound science. But local officials confronted by alarmed constituents are not in a good position to evaluate competing arguments. Meanwhile, larger wind farms face no such array of local Mixmasters. They go to one agency -- the state Public Service Commission. Wind farm plans face a rigorous PSC review process. But at least developers know what they are dealing with from the outset. It's a far better system, both for encouraging wind farm development and protecting public safety and health. Wisconsin's hostile regulatory environment for smaller wind farms is taking a toll. The state lags far behind neighboring Iowa, Minnesota and Illinois in wind power. Part of the reason is that Wisconsin has less potential for wind power than those states. But testimony at last week's hearing indicated that regulatory hostility is also a factor, driving some wind farms away from Wisconsin to its neighbors. That conclusion is supported by the fact that Michigan, with a relatively small potential for wind power, has a far higher wind farm growth rate than Wisconsin. The solution lies in the proposed legislation that was the subject of last week's hearing. The plan calls for lawmakers to grant the PSC authority to establish, with public input, a model set of wind farm standards to guide local governments. Local governments would be forbidden from exceeding the standards. Any party would have a right to appeal a local decision to the PSC and then to court. Wisconsin can protect the health and safety of residents and encourage wind farm development. The proposed wind farm siting reform is the answer. 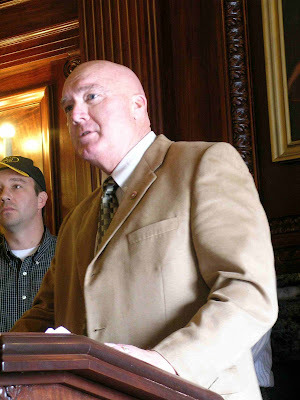 Terry McGowan of the International Union of Operating Engineers Local 139 speaks at the press conference for the introduction of a bill to set uniform siting standards for wind projects in Wisconsin. MADISON – A bipartisan coalition of Wisconsin legislators announced that they are introducing legislation that calls for the creation of uniform siting standards for wind energy projects. Senate Bill 185 (SB 185), and its Assembly companion, directs the Public Service Commission (PSC), after public input, including a stakeholder committee, to establish by rule, permitting standards to be applied by local or state government to wind energy installations, regardless of size and location. "We can't build a 21st century energy infrastructure by digging in our heels,” Senator Randy Hopper said. “This legislation will ensure that interested parties from all over our state can take part in developing the Public Service Commission's guidelines." "Wind power is job-creating power," according to Representative Phil Montgomery. "A fair and uniform state standard for siting wind developments will create an environment of investment in our state while moving us closer to our green energy goals." In addition to RENEW, the following organizations issued statements of support for Senate Bill 185: CREWE, Clean Wisconsin, Citizens Utility Board, Customers First!, Renewegy, Wind Capital Group, WPPI/Municipal Electric Utilities. Focus on Energy provides links to renewable energy training courses -- professional development, technical colleges, and universities. The Southwest Wisconsin Local Farm & Food Economy Report was funded by the Valley Stewardship Network’s Food and Farm Initiative in a cooperative effort with Vernon Economic Development Association and the Crawford County UW Extension office. We hope to see you all there!! There is no charge to attend but donations are encouraged. Local beverages and snacks will be served. “We wanted to do something genuine, not phony,” said Bob Chesebro, president of family-owned Wigwam Mills, Sheboygan, about his company’s decision to install a solar energy system. Initially, Chesebro wasn’t sure which kind of solar energy system to go with. But the more he delved into the question, the more he came to believe that solar hot water would provide the best fit for the 103-year-old company. Placed in service in February 2008, Wigwam’s 27 solar collectors supply 47 percent of the hot water used by the company to shrink, bleach, antimicrobial treat, wash and soften 40,000 pairs of socks each day. . . . The Legislature's budget committee on Friday approved a plan to use a mixture of higher sales taxes and car rental fees to pay for high-speed rail and other transit projects in the two most populated parts of the state. The measures, part of the two-year state budget, must pass the full Legislature and be approved by Doyle before it becomes law. In Dane County, a half-cent sales tax could be imposed to pay for commuter rail and other transit projects. In Milwaukee, Racine and Kenosha counties up to $16 could be charged on car rentals to pay for a commuter rail line connecting the three southeastern Wisconsin cities. A new board created to oversee the rail line's construction also could levy $50 million in bonds to help pay for it. The project has been discussed for years but always stalled over ways to pay for it. Also, Milwaukee County would be allowed to impose a 1 percent sales tax to pay for a countywide regional transit authority. The $132 million raised each year would pay for transit, parks, cultural and emergency medical services. Fifteen percent would go to the city of Milwaukee. On a 9-7 vote, the committee voted against Gov. Jim Doyle's proposal to create a regional transit authority in the Fox Cities to help pay for the existing regional bus system using up to half a cent sales tax. . . .
Commuter rail supporters include environmentalists, business groups, organized labor and local governments, and organizations representing the disabled and elderly. They supported commuter rail to ease congestion, create jobs and spur economic development.